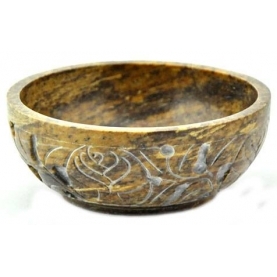 Place the lit charcoal in the soapstone resin bowl. The bowl or incense burner can be filled with a little sand or dirt. Now you are ready! Add a small amount of resin on top of the charcoal. The resin will burn and soon release essential, aromatic oils through the smoke. Continue to place resins or powder on charcoal as they burn out and smoke decreases for a continuous burn. Saftey: DO NOT HOLD THE TABLET IN YOUR HAND WHEN LIT!